Considering the current climate changes and those expected for the next decades (+ 1 to 2°C), the sustainability and the typicity of terroirs must be taken into account. The continuous degradation of the organic status of soils generates erosion and dysfunctions which play a crucial part on the capacity for adaption of grape varieties and the quality of crops. 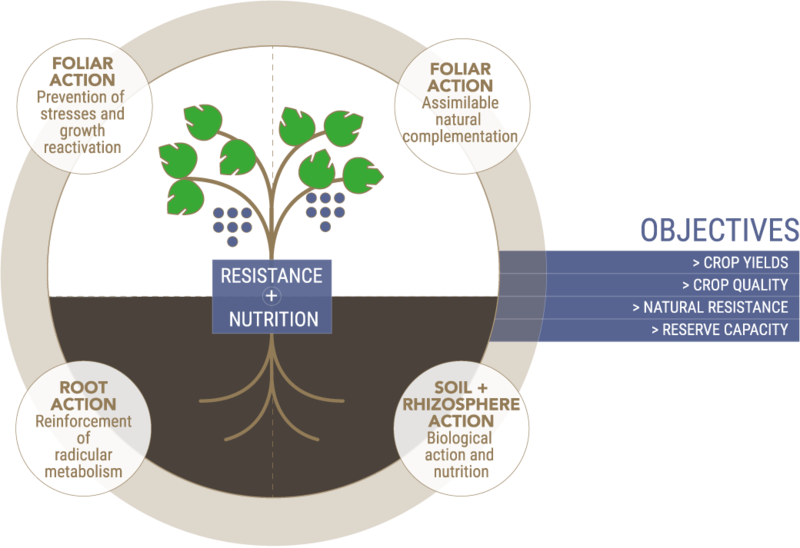 In such circumstances of pedoclimatological imbalance, the rhizosphere which is the actual interface between soil and plant, represents a major lever to stimulate the resistance and improve the nutrition of the vine. Indeed, this exclusive place of exchange corresponds to the root proximity environment, including all the biological and physico-chemical activities (bacteria, fungi, organic molecules) involved in the feeding and self-defence mechanisms of the vine. Centered on 3 targeted actions (soil-root-foliar), Frayssinet’s NSP (Nutrition and Stimulation Program) helps to maintain a good activity of the rhizosphere. It uses organic fertilizers and natural stimulators which, depending on the needs and expected results, act on the improvement of the physiological mechanisms (mineral and water feeding) in stressful conditions and on the resistance of the vine (aerial and root systems). Tested on different vine terroirs in severe conditions, the results of our programs show a better development in the growth of vines and a real optimization of vine growing productions. By operating these NSP experimental results we have managed to have a better understanding of the benefits of ecosystems (soil, root, plant). Their synergistic actions allow the development of specific NSPs combining productivity and sustainable protection of vineyards. Contact us for more information on the NSP.